A home visit will be performed by Homeowner Services Committee members to verify a Housing Need. Ability to pay Buyer’s closing costs. Some closing costs are required to be paid prior to closing. (* amount is based on total household income). The balance of the Buyer’s closing costs will be due at closing. A gift of money from a close relative may be used to pay closing costs. See “Requirements for Gift Funds” below. Evidence of the transfer of funds. Evidence can be the donor’s withdrawal slip and your deposit slip; a copy of the check and evidence of its deposit into your account. We must be able to verify that the donor had the money for the gift in their account for at least 30 days prior to the gift. The donor’s bank statements will be used for verification purposes. If the donor borrowed money for the gift, they must be able to document the source. The gift CANNOT come from cash the donor has on hand. It must be in a verifiable account. The income limits required to be ELIGIBLE for the Habitat Homeownership Program are based on the number of people who would be living in the home. The limits are 30% to 80% of the Area Median Income (AMI) for Hillsborough County, (the numbers are based on guidelines adjusted each year and defined by the U.S. Department of Housing and Urban Development (HUD)). These figures include many forms of income: employment, public assistance, Social Security, disability, child support, etc. 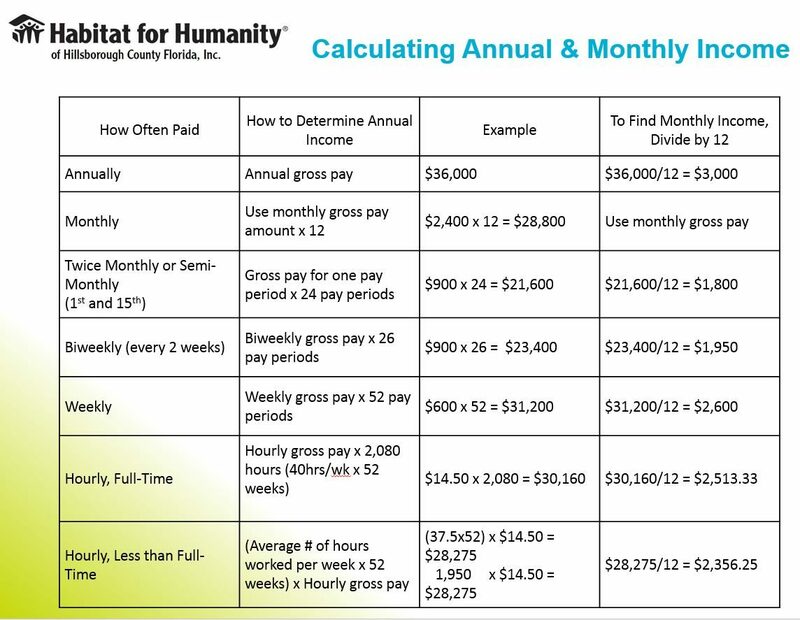 The minimum gross monthly income needed to support a Habitat Hillsborough mortgage is listed for household sizes of 1 to 4 persons.